Why handle DBF files nowadays? One can think that DBF files are obsolete, inefficient and there is no necessity to manage and handle them. But it's very big mistake. Despite existing many brands of relational databases, for example Firebird, Microsoft SQL Server, Oracle or MySQL, file-based databases are still widely used. Probably not to often in new applications and projects but big amount of data is deposited in particular DBF files and should be converted from there - e.g. while migrating from older software system to new one. In this cases suitable software can save much time and effort. DBF Viewer 2000 is one of best solution for these purposes and we have been using it for approx. 10 years. DBF Viewer 2000 offers powerful editor and viewer of DBF files. Basic type of record view is a grid containing all columns (table fields). Form view for detailed viewing and/or editing is available as well. BLOB fields are supported when DBF Viewer 2000 can work with very large DBF files, more than 2GB. Common set of functions and features is available - user can search and replace values across the tables, sort data with using one or more columns (fields), print content of every record or whole table, format desired values (Upper, Lower, Capitalize). Saving DBF file in different format is common and frequent task and reasons for doing that can be different. We encountered damaged index files and/or problems with reading BLOB fields (typically MEMO type) in some DBF files that we intended to migrate for many times. In these situation we found very useful the option for Restructuring tables. With its help you can determine what fields will be considered in new format of DBF file and what shall be ignored. Data in DBF table can be exported in many various formats - either as a common proprietary file types (Excel(XLS,XLSX), CSV, TXT, SQL, SDF, XML, HTML, PRG, SQL file formats) or as a SQL script with support of many database servers (MS SQL, MySQL, Oracle, PostgreSQL). DBF Viewer 2000 is fully compatible with Windows XP/Vista/7/8/8.1/10 and Windows Server 2003/2008/2012 (32/64-bit). 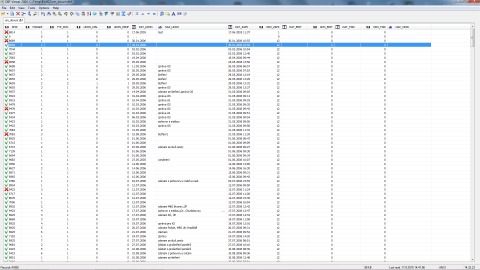 DBF files can be easily associated with DBFViewer 2000 and consequently opened very quickly and comfortably. DBF Viewer 2000 supports all kinds of DBF file - it means Clipper, FoxPro, Visual Foxpro, dBase III/IV, dBase Level 7 and HiPer-Six. If you are interested in obtaining DBF Viewer 2000, you can do it at our Discount page and get 10% discount of common price.